Perhaps the best thing that I see in this company is that, it has a free and fluid atmosphere that is not bound by tradition. For example, if the company hosts a drinking party, the one who arrived at the venue first will already have started drinking. It is because it would be inefficient to wait until everyone arrives, and the one being waited for would worry about causing trouble to his companions. I don’t like wasting time. If you look at it negatively, it may seem rude, but our company does not observe such formalities. The company has been like this since a long time ago, and I would like my employees to keep valuing this kind of freedom. My father was a salary man, and we were relocated so many times. As a child, I kept transferring to different elementary schools. Because of that, I became a keen observer to everything that is going on around me. My ability to see through the eyes of people also developed naturally, which made me become discerning even up to this day.Although I studied hard when I was still a student, I was the type that read a lot of books and spent time as I wanted, rather than being very serious about taking my classes. It may sound audacious, but from that time, I have always been thinking about what I want to do and how I would want to live my life. 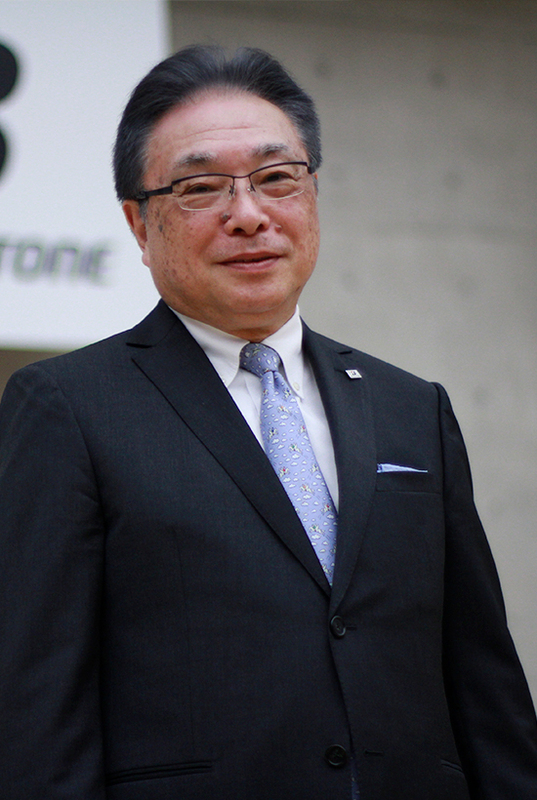 I worked in Bridgestone after graduating college; however, at that time, I did not think that I would continue working for the same company for 40 years. I have read a lot of books and thought about a lot of things. As a matter of fact, because of my youth and lack of experience, I was stuck-up about thinking that I was different from other people. But when I joined the company, I have met a lot of people with strong personalities, those that I have not yet encountered before, and from that, I fully realized that I am just an average person. Soon after joining Bridgestone, I went to the US to acquire a master’s degree in Business Administration. I went abroad because I wanted to change myself and try to see the other side of the world. Surely, my knowledge and understanding in business deepened, but my communication skills improved dramatically upon meeting and actively interacting with various people. I realized that I did not know well about my own country every time I get asked about Japanese politics and culture. But thanks to my experiences, I have learned to come out of my shell and to not be shy with people I meet for the first time. Until now, I believe that this has become my strength. Meanwhile, in 1988, the company acquired Firestone, a major tire manufacturer in the US, greatly maneuvering Bridgestone into globalization. Together with Firestone, which has several production facilities in North America, Central and South America, as well as in Europe, we aimed to expand our network of production bases and put all of them to good use. 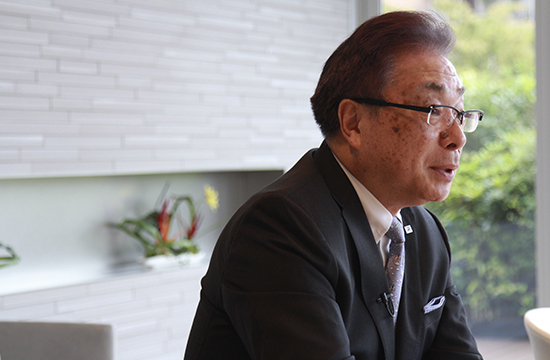 I was proud to be chosen as one of the members of the so-called "second foundation", and I wanted to make it successful at all costs.However, the difficulty started after the acquisition. Deficit has continued for several years, and for more than 20 years even after that period, it was difficult to say that I was able to contribute to the company's revenue. I was not able to understand the difference of US and Japan in terms of way of thinking and culture, so I was not able to handle it successfully. But I have improved myself from that experience, and we were able to boost our performance over the recent years. Four years since I was appointed as CEO, we have set our eyes towards "being a truly global company", and it means having a consistent strategy and policy as a group and to give each businesses authority to develop their own areas. In managing a business, I believe it is important to keep the balance between global and local, which I refer to my own word as "glocal". Which is why, we are advancing reforms that give importance on how to build a corporate culture and management system, and on how to educate our human resources. We are still working on it, but I am confident that it will gradually yield great results. From now on, I would like to continue establishing new business models. Instead of simply selling tires, I am thinking of offering several services involving maintenance, management, and more, all while making full use of information technology. I would like to create a business model that can lead to solving my clients' management woes. In addition to the founder's unwavering spirit of contributing the highest quality of service to society, we have to create something very unique that others cannot match. And that's the kind of spirit that I want each of our employees to have. I often say to the young that neither the people, nor our society, is perfect. The heavens may reward you for doing something good, but it is best not to think of it as a norm. Life is not all about being happy. It always comes with some trouble and suffering, and it will be easier for those who think that way.